Reuben LOVES bath time. Occasionally he HATES it but on the whole it’s a very positive part of the day. When you’re on the bedtime count down, and everything is ending in tears, knowing that bath time is just around the corner keeps me going. 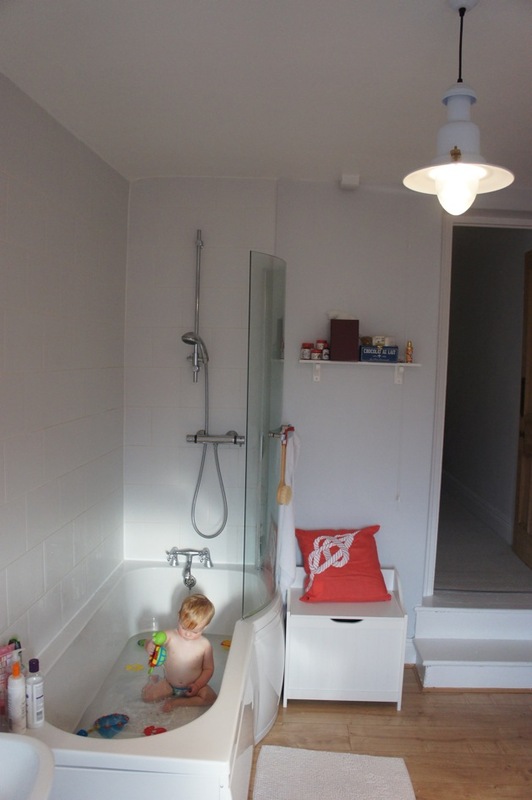 When Reuben was still wee and couldn’t sit up, I quickly got sick of leaning right over the bath to keep him upright at bath time. So I would lay him down in shallow water and he would kick and scream (in a good way) to his heart’s content. 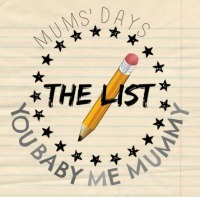 He loved it with such vigour that one night, when I was bathing him at my sister-in-law’s she came bombing up the stairs because she thought something awful had happened. But no, he was just thrashing around, soaking her bathroom! Heh heh. My cutie-pie! 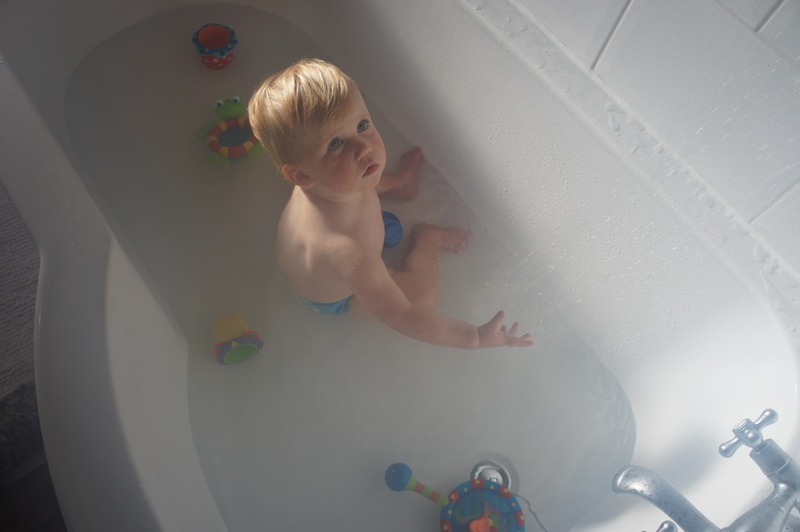 In the early days of Vine (so therefore very short and rather shoddy), this is a snapshot of Reubs splashing in the bath. Once he started to sit up he was suddenly interested in toys to grab at and generally chew. 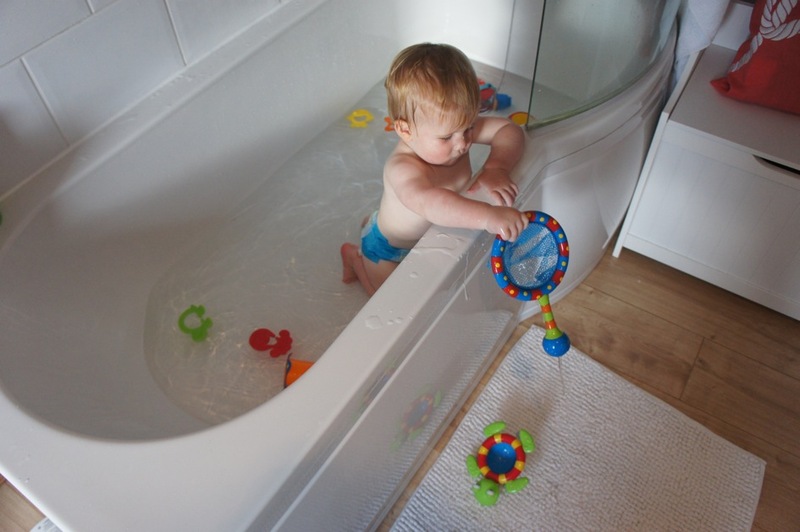 Fast forward to today and he is aaaaaall over the bath and his toys. It’s funny to see week to week what he’s into. One week he’s always knocking the bottles off the side of the bath and has no interest in his toys, the next he is interested but just to drink out of, the next he’s all about water flowing through. Now, I’ve been chatting with Theresa from Nemo swimming, the award-winning swim school that we take lessons with every Tuesday afternoon, with interest about bath time. 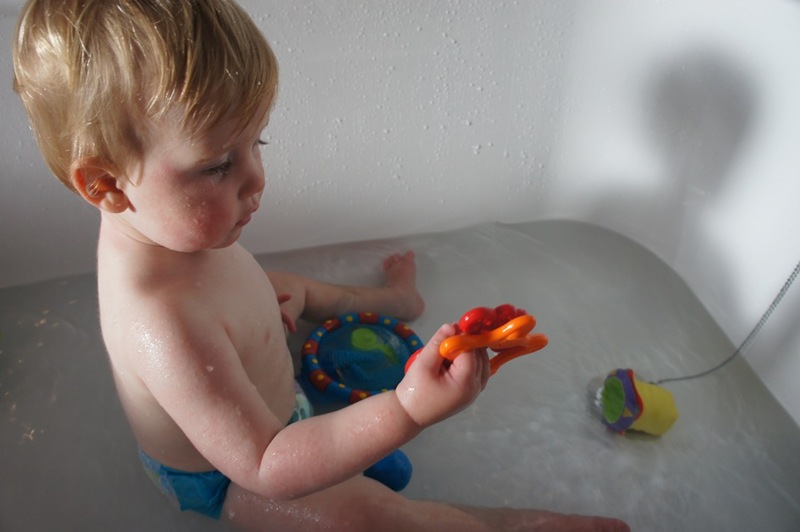 I’ve noticed that we use quite a lot of toys in our lessons, so I wanted to know how I could better use bath time and toys to get Doobles to be more confident and happier in the water. Obviously normally we don’t wear a swimming nappy but for the sake of this post and Reub’s modesty…! And, Theresa said, “Bath time is a great way to get babies used to water. 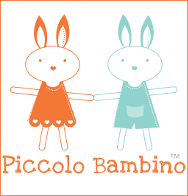 You want to help them become more comfortable with having water on their faces. 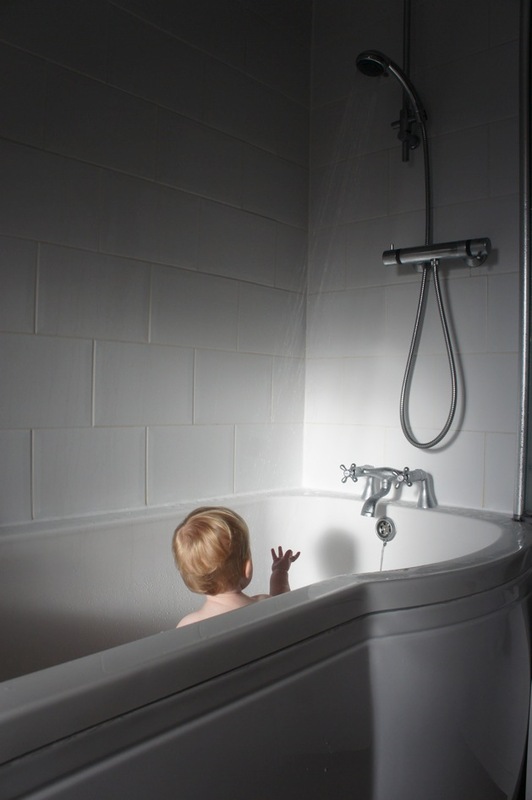 For example, use a watering can to pour water over their head or even have a shower with your child so they become unfazed by the water running over their head and face. This will benefit both their swimming confidence and will make your life much easier when hair washing your young children! 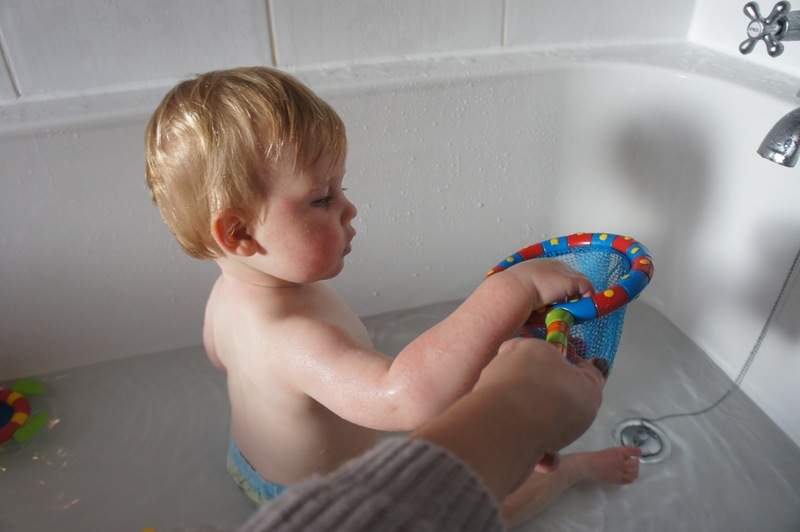 “Using toys in the bath is a good way for babies to enjoy their bath time, they are a great stimulant and a lovely way for babies to enjoy playing with water. 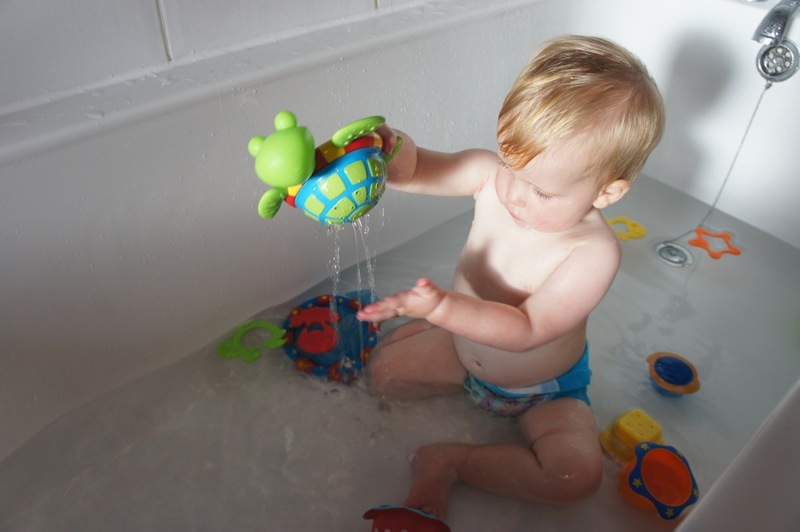 In the pool, toys are not only a great distraction for the child to look at but also help to teach babies to reach out to catch the toy which has a big impact on developing the skill of holding on. Holding on is one of the key safety skills for a baby to learn. Many of you will know that I am a Nuby blogger, which means they send me products to play with or eat off or drink out of. Most recently we were sent some lovely bath toys, and in light of what Theresa has said, I thought this would be a good post to introduce some of the toys, give you an insight into our bath time routine and, well, basically it’s a good excuse to get some cute photos of my babe in the bath! 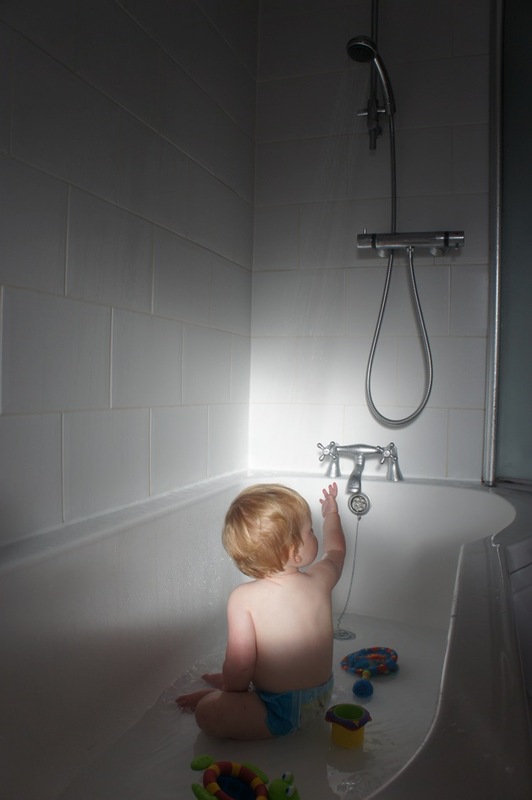 What I’ve started to do is fill the bath with shower water because Reuben loves the jet – sometimes, when we’re tight for time and I need a wash, I get in the shower too and he’ll just sit at my feet with the water running over his head. 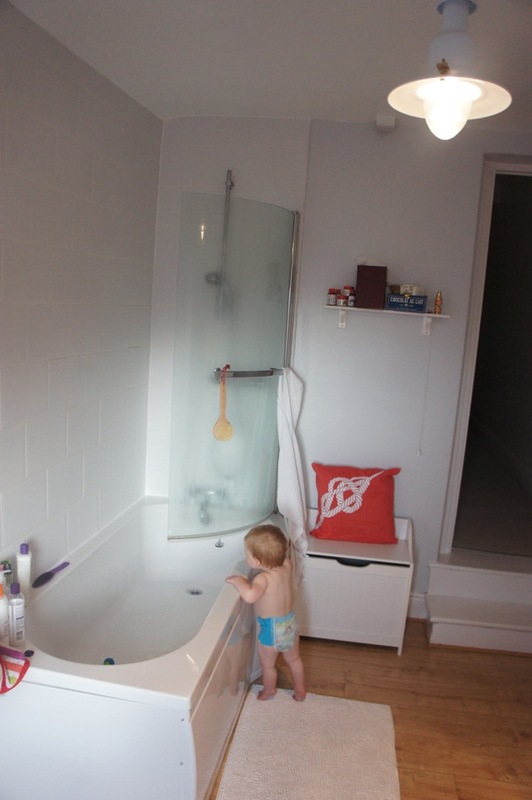 So I think the shower wins as best toy ever, but once the bath is full enough it goes off! The first Nuby bath toy I wanted to introduce is the Bath Time Net – this makes me feel well nostalgic for catching fish as a kid! To begin with I would ‘catch’ things in the bath and Reubs would take whatever was in the net out. Now, he has started to collect only the right toys (4 little floating shapes; turtle, octopus, star fish and fish) and putting them into the net. What a smarty pants! And the next step will presumably be him learning to catch the shapes with the net. They go in the net! The second toy I wanted to mention is the Splish Splash Stacking Cups. Stacking cups are obviously easy to come by and you can find cheaper ones but what I like about these ones is that each cup has a different shape on the bottom and it goes from 2 holes up to 6 – both of which give the toy a bit more longevity as once your babe is counting or learning shapes, you can be doing that in the bath too. But at present the cups are purely a drinking vessel (yuk!) or more recently something to watch the water flow out of. He can sit for ages just picking up a cup watching the water flow out the bottom then put it back in the water and repeat. The splish splash stacking cup – useful for pouring over his face! Not bothered. In line with what Theresa was saying, I do use these cups (and the turtle below) to pour water over Reubs’ head, and he’s learnt to not bat an eye lid! I also use the largest one to wash his hair with because he REFUSES to lie down now! 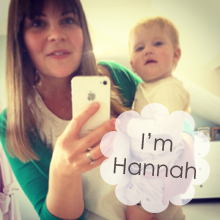 So heed Theresa’s advice and encourage your little one to lie down for as long as poss! And here’s Mr Turtle. Why are turtles so pleasing to me? I don’t know but he’s a pleasure to have around at bath time and I love him! And I love Reuben’s concentration when he’s playing with him. And, what was I saying before about the next stage with the net would be catching the toys?…silly mum, this is the next stage. chucking the toys out and soaking the floor! Time to get out! Then with some fuss we get ready for bed (tip for this time is to have an empty bottle of calpol and the box it came in – keeps him entertained long enough to do his cream, apply nappy and get him dressed!) 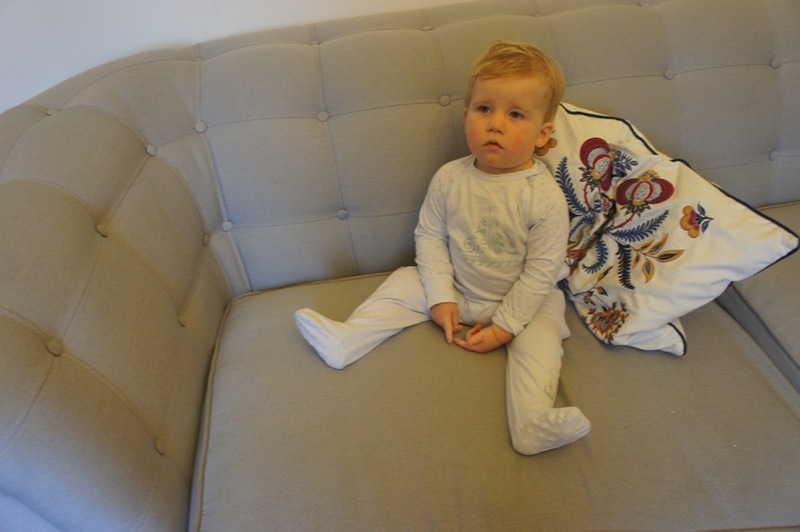 and my little water boy is snug, clean and dry, and because he’s a little bit poorly he’s so tired he’s even sitting still to watch telly. Unheard of, so I poke him to get a smile! 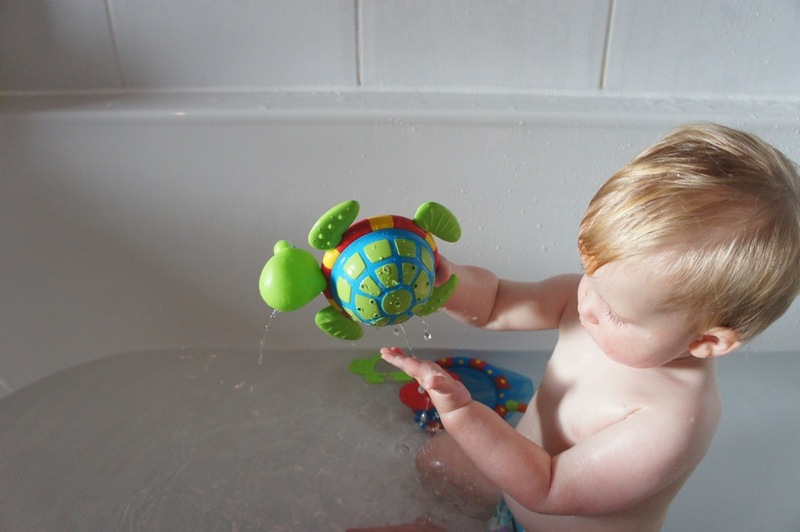 What Bath Time toys does your little one like to play with? And do they even like bath time? ?